I got my Trek play test materials from +Modiphius Entertainment for the new RPG coming out. Was going to spend some time with them yesterday but other things like the day job came up. Though I have managed to print out the rules and will be going over them soon. Over the summer I mentioned a desire to play some Trek using what ever rules seemed right. Likely White Star, but now I might try a simple training mission using these rules in addition to the official playtest. 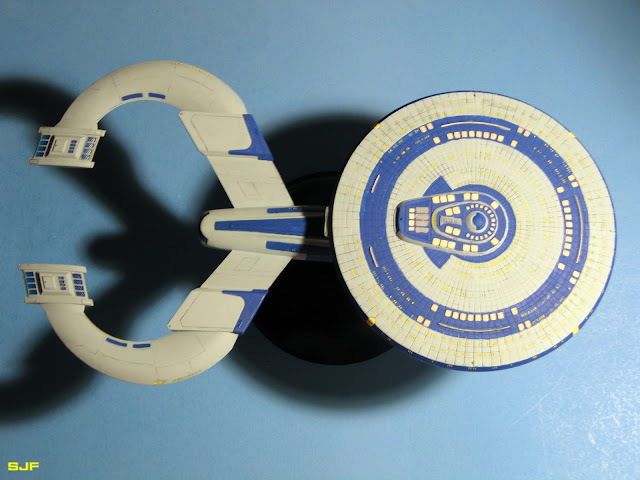 Of course I'd make mine the NCC-3120 USS Protector; an homage to all the ships that inspired it. I love the idea of those experimental nacelles. 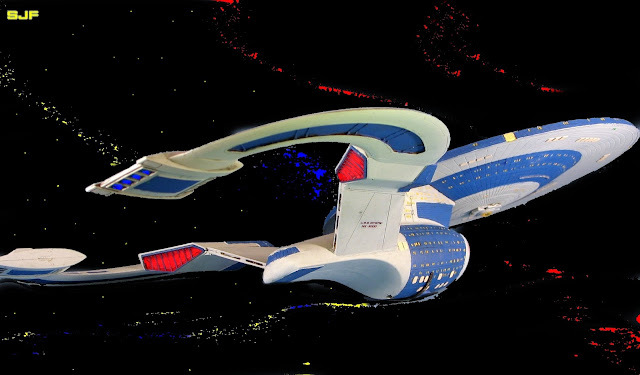 Not to steal too much from Voyager or even Event Horizon, but my basic outline would be that while testing their new Warp-13 capable engines (shout out to the Omega-13 from Galaxy Quest) the USS Protector is transported ...somewhere... and in this section of space the stars are right and there are horrors. 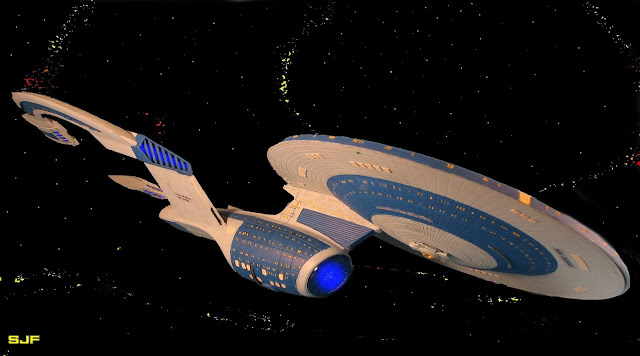 The game would have other technobable details like the curvature of the warp nacelles and how this ship uses triberyllium instead of trilithium in it's warp core. Maybe it is a design upgrade the Federation got from the Thermians (all from Galaxy Quest). This produces an "asymmetric warp field". So start off as a regular Trek-like game, and then BAM hit them with the horrors. Hey, maybe the Theramins are evil. Who knows really. 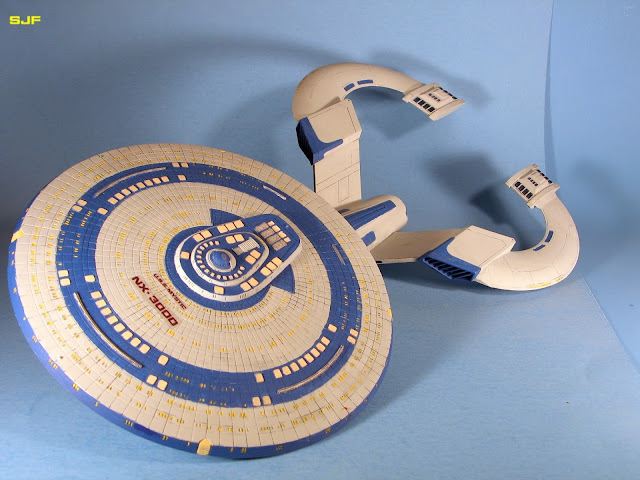 Since it is based on the Ambassador Class space frame I could put it in the Enterprise C era. Though if it is an experiment and the prototype in NX 3000 how do I explain the jump to NCC 3120? No idea. Maybe the old classic it was a clerical error in the system registry databases. I have a small Ambassador class Enterprise C at home and I think it is a great looking ship. I just want to do something with it. In any case I am going to enjoy this. I am ready with the beats and the shouting.